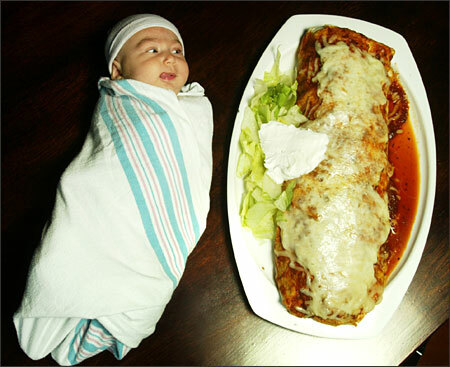 Mexican restaurant Gorditos prides itself in serving a burrito the size of a baby. It’s customers have taken up the habit of taking a photo with their new born next to the burrito and putting the image up on the ‘baby wall‘. More than a frivolous prank the restaurant’s photo wall of newly borns exhibits several fundamental relationships between body and food. We are what we eat, but we also are how much we need and want. As most interesting images of abundance will do, the Baby Burrito represents both the problem of overconsumption as well as its solution. The problem is that we are insatiable, the solution is shrinking the body. The body is the measure of all things, as was proven only recently in the Barbie Experiment conducted by the renowned Karolinska Institutet. Using your baby to measure the size of a meal thus makes perfect sense, adding a sense of physicality to the experience of abundance. In 2011 The Incredible Shrinking Man tried to create a similar experience by roasting an ostrich and serving it as if it were a chicken. The average size of a newly born baby is 50cm, the exact size we aim for. If we’re willing to shrink towards abundance we could feed up to 100 people with a single Baby Burrito.